PADE Pennsylvania Association of Developmental Educators – Helping underprepared students prepare, prepared students advance, and advanced students excel! 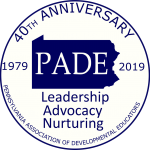 Founded in November 1979, the Pennsylvania Association of Developmental Educators (PADE) is a statewide professional, non-profit, educational organization addressing the needs and interests of developmental educators from every type of postsecondary institution in the state. PADE is proud to serve the needs of developmental educators in the Commonwealth of Pennsylvania and is firmly dedicated to the notion that all students can learn. This commitment is exemplified in our dedication to the professional development and networking of our members and our unwavering service to our students. Affiliated with the National Organization for Student Success (NOSS)*, PADE is recognized for its leadership in, advocacy for, and nurturing of programs/services for academically underprepared students and other special needs populations served by institutions of higher education. PADE membership is open to anyone interested in developmental education and consists of teachers, counselors, administrators, other educators, and supporters from all types of educational institutions. PADE is governed by a board of directors with elected representatives from public, private, two-year and four year institutions as well as elected chairpersons from each of its five designated geographic regions. In addition to scheduled meetings of the board of directors, at least one meeting of the full membership is held annually.